Magic: "Possessing distinctive qualities that produce unaccountable or baffling effects." What is magic? It's difficult to express through words because by definition, it harbors a quality that proves "unaccountable" and "baffling." We cannot understand magic itself, but we can admire its essence -- the shimmering possibility of the illogical. It gives us hope that we could be encircled by inexplicability, if only we fell into the right well. Of course, magic has long fueled heated controversies over reality and fiction. Scientists search for answers to justify any vagaries existing in our cosmos. Monotheistic religions demonize more spiritual, superstitious practices as heretical and satanic. And most tragically, we -- the masses of the 21st century -- now look at magic with apathy and disbelief. We cannot grasp the possibility of a universe where witches and warlocks gallivant freely, so why should we believe in their sorcery? What gets lost in legend is the obvious truth that we have all experienced magic, if only briefly. It lives in the feelings that we can't rationalize, in the occasions that seem like déjà vu. We've chosen to ignore this peculiarity because as individuals, sacrificing control and agency to an unknown force is too daunting. Moses Pendleton, on the other hand, has the humility and confidence to accept the existence of magic and repurpose it as his tool. In his latest work for Momix, he maneuvers the uneasiness of incredulity with earnestness and grace. Alchemia opened at the Joyce Theater early in July. The venue is famous for its devotion to dance, while Momix has sparked dialogue about the art form itself -- what is "dance," and can something as abstract and athletic as Alchemia be considered anything more than movement? Few cynics mention that Trisha Brown walked on walls and was heralded as a revolutionary, or that many choreographers have tried to re-physicalize human, pedestrian motion for a concert space. "Dance" is more than rigid technique descended from the aristocracy. Still, there's a stigma that surrounds Momix, a for-profit troupe that relies heavily on illusions to awe audiences and garner a fandom. 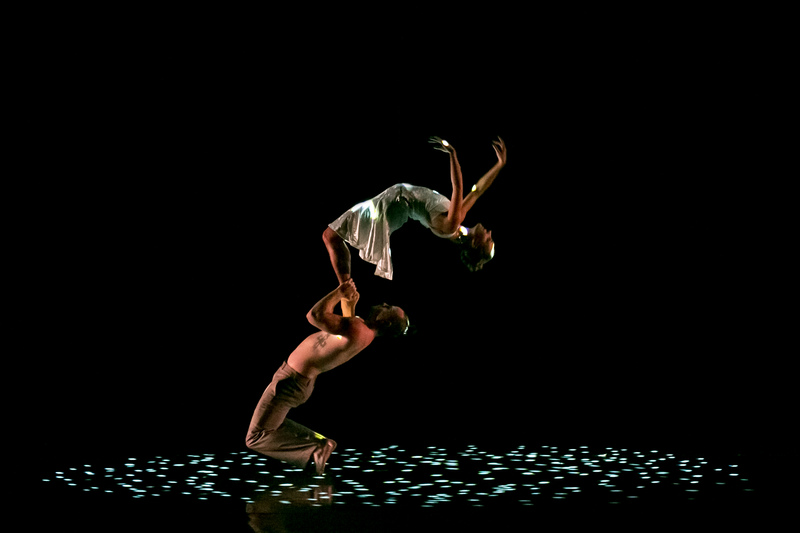 Admittedly, critics may have a point; perhaps, Momix isn't "dance." Despite decades of training at prestigious academies like Dance Theatre of Harlem and the Ailey School, its artists do more than make patterns onstage in an abstract investigation into aesthetic. Therefore, they don't resemble most of what we view when we attend "dance" shows today. Instead, they use their talents to become authors of splendor. Based on the four elements, Alchemia is divided into two sections: "Quest for FireWater" and "Led into Gold." The production starts out slow, as though the public must be ushered in gently so they won't scare. Long pillars bubble in a continuous flow while the ensemble moves with subtleties. The result? An interesting and eye-catching tableau, but nothing of particular note. Then, the sky crashes into the theater's scrim as skeletal beings glow like stars in the darkness, their bodies suspended with weightlessness. Gravity no longer applies; we are in outer space, watching the Earth from a distance. Later, an air-bound pixie duets with her mate, drenched in an elegant blue hue. They touch, but a wind current blows her backward until they fight to embrace again. Together, they embody the beauty of a dandelion's wispy seeds gliding on the air, or what it feels like when you first realize you're in love. The serenity lingers, but it's finally overtaken by reckless abandon when three women swing on harnesses, running forward to fall back and dashing limbs in any direction to evade stagnancy. They're the spitting image of liberty, their faces illuminated with determination and the need for adventure. Their hair flies. Their eyes burn. They cover the floor in zigzags and semicircles, disrespecting organization for serendipity. As the curtain closes after an hour and a half of memorable moments, viewers beg for it to only be intermission despite a program note that warns otherwise. Momix's female dancers are especially agile; their classical training compliments the less traditional choreography to combine ability with ingenuity (the men, though handsomely robust, could work on their lines). But more importantly, the audience is struck by the overwhelming sentiment that we have just interfaced with genius. How Pendleton could imagine such a sensory overload from dust is incredible. He has successfully envisioned a mutualistic relationship between dance, music, costume, prop and projection that seems improbable, if not impossible; how would one person conceive of so much from nothing? And then, an epiphany: the answer is simple. How blind we've been -- it's just magic. Alchemia runs through Aug. 1 at the Joyce.